While many cider producers view theirs as a commercial product, France's Eric Bordelet approaches cider-making with the same intensity a passionate enologist brings to winemaking. Bordelet worked as a sommelier in the famous Parisian restaurant, Arpege. 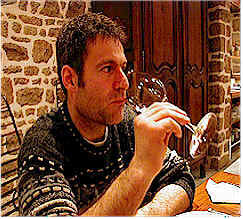 He became deeply familiar with the top winemakers and wineries of France (especially). 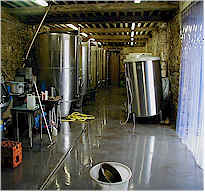 The family farmed orchards in Charchign, a couple of hours drive north of the Chenin Blanc "belt" in the Loire Valley. "Bio-dynamic farming is very interesting to me." We had a look at the various orchards farmed by Bordelet and one can see he is very fussy about cultivating the best quality fruit. "We gather the fruit by hand," Bordelet tells us. "Most commercial ciders are mechanically harvested. That is certainly less costly, but hand-gathering allows us to avoid including leaves in the press." If you visit French wineries, every day you'll hear people talking about "terroir," the particular place a wine originates. Winemakers become teary-eyed speaking of their precious five rows of vines in a particular premier cru site, telling you about the soil and sub-soil. Well, we heard even more about terroir from Monsieur Bordelet! "We have three soil types," he told us. "Schist, a schist and granite mixture and then pure, granitic soil. Each plays a role in determining the character of the fruit we get." The fruit is dry-farmed, as Bordelet prefers to work with tiny apples and pears. Many of the commercial cider firms irrigate their orchards as they cultivate for greater yields. "The fruit we work with looks quite different from what you'll find in the grocery store." says Eric. Eric Bordelet (left) admires the pear trees of Monsieur Henri Maherault at Le Grand Coudray. Some of the trees, they claim, are 300 years old! Bordelet's father was a home cider maker. "I know what each apple variety brings to the cider," he says, explaining that "The Argelette cider, for example, has about 20 different varieties in it. I use about 40% of sweet apples, 40% sour apples and 20% of acidic apples to get the right balance. 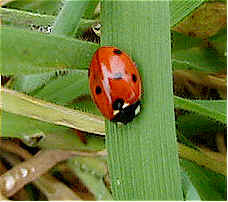 The acidic fruit brings perfume, while the sweet ones contribute body." Having tasted Bordelet ciders over the past couple of years, it seems to me that his products are improving. Bordelet agrees, saying "I have found my balance over the past give years of making ciders. There is no 'magic' to this, only many small details." His first vintage was 1990 while working at Arpege. His ciders, while sparkling, might not have as much effervescence as some. This is a conscious decision on Bordelet's part. "I want it this way because it shows off better the character of the fruit." And, if you've got older bottles of cider, Bordelet suggests decanting them! The new vintages are uniformly excellent. "Doux" is a sweet apple cider, with about 80 grams per liter of sugar, yet it is beautifully balanced. A Brut apple has but about 5-10 grams per liter, so it's drier than many Brut Champagnes! In France Bordelet offers a "Demi Sec" bottling of apple, but for our market the wine is called "Brut Tendre," having 25-30 grams of sugar per liter. This actually tastes "dry" to most people. 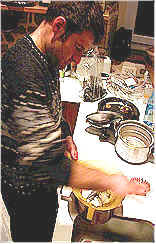 The Argelette, Eric notes, "is more winy. Some vintages have to stay in the cellar longer. Argelette is the type of soil and it's the same 40-40-20 blend of the other apple ciders." This tends to have more skin contact, he explains. Poire Authentique is the basic pear cider. It has some vinous notes and a crisp finish. "The pear skins bring some tannin." Bordelet explains. Poire Granit actually has 75-80 grams of sugar per liter, yet it doesn't taste particularly sweet. This is due to the tannin and acidity, which Bordelet says is twice as high as the apple! As Bordelet's ciders are produced in small quantities, please check with us as to what it currently in stock. We have found that once people taste these, they're hooked! 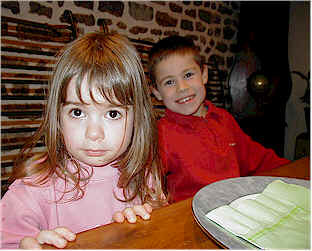 Little Romi & her Big Brother Julien, the next generation of cider makers. The Pacory family has owned the La ferme des Grimaux since 1939 and it's located in the Domfrontais, the region where they make Calvados predominantly of pears rather than apples. In 1959 the family began producing Calvados and today the property comprises close to 90 hectares with hundreds of pear and apple trees. They have some very old trees, as well. The Pacory family points to the local saying about it taking a hundred years for the trees to grow, a hundred to produce fruit and a final hundred to die. With respect to their pear production, they claim to have about 50 different types of pears (and 20 different incarnations of apples, for that matter). We have a very bright, fresh, fruity pear cider ("perry" as pear wines are called) from the Pacory clan. The fruit is hand harvested and pressed gently. They tell us it takes 12 hours to press the fruit to produce this cider. The juice ferments about half-way before they put in into bottle. Frederic and Catherine Pacory also have an honest price on their wonderful fizzy perry... Well worth trying! 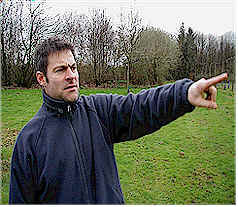 Etienne Dupont took over the reins of the family estate back in 1980 and today has about 27 hectares of orchards for his distilling and cider-making business. 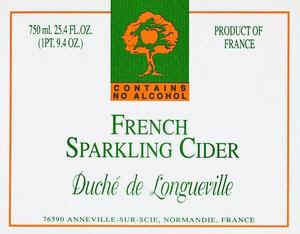 His ciders come from orchards within the Pays d'Auge, a special region within the area of Normandy. Dupont says he gets about 600 liters of juice from a ton of apples. This is close to the yield of juice from a ton of grapes. 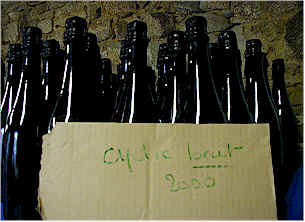 Dupont doesn't pasteurize his ciders and they're bottled in 750ml, "champagne"-styled bottles stoppered with a cork closure. At bottling they're around 3% residual sugar. These are vintage-dated and said to age and develop additional complexity in the bottle. Dupont explains his cider displays fruity notes in their youth. With a bit of time they start to show notes of lime or pine...further aging brings out a leathery, buttery character and, as they get old, the cider shows a woodsy, smoky character. Harvested in mid-October of 2005, the cider we have in stock is made 80% of bitter-sweet apples (mainly Saint-Aubin, Binet Rouge, Frequin) with 20% of a more acidic variety called "Judor." Dupont says the cider develops a sediment of the spent yeasts (native or indigenous yeast fermentations are the rule here). This vintage will last well into 2006, most likely. This special bottling is made of organically grown fruit. This product has not been pasteurized and therefore may contain harmful bacteria that can cause serious illness in children, the elderly and those with weakenend (sic) immune systems." Those of sound mind and body may purchase this product providing they show proof of being of the age of majority. Taunton's cider comes to us from south-western England in Glastonbury. This location, in Somerset County, has been an apple-farming region since the time of King Arthur, around the sixth century! There is quite an amazing history to the origins of apple cultivation in this region. The Celtics (not the basketball version of such) believed apples were some sort of divine fruit and that drinking the cider from this fruit provided them with some sort of "connection" to an after-life or "Otherworld." In the legend of the Holy Grail, "Uncle" Joseph of Arimathea brought his nephew, a fellow named "Jesus," with him to Glastonbury. The story goes that Joseph brought the cup, or "grail," Jesus is said to have drank from at The Last Supper after the Crucifixion, back to Glastonbury and it was lost. And thus, the search began! Another part of the legend is that Joseph, returning to Glastonbury with the Holy Grail, planted his "staff" in the ground at a mound of rock called "Tor." It's said the "staff" took root and grew, being made of the Blackthorn bush, a plant native to Syria. I read that, though it's planted in other parts of Britain, only on Tor does this bush put out white flowers at Easter and red ones at Christmas. Spooky. In any case, the firm that makes this famous cider is now within the stable of Constellation Brands, the same folks who make Arbor Mist fruit-flavored wines, Franciscan Napa Valley wines, Simi, Estancia, Paul Masson brandy, Almaden wines and "Babycham," a popular British drink that is aimed at a female market. We have small bottles of Blackthorn Cider, priced at $1.79 each. I don't know much about the Wyder's Ciders. The firm was founded in 1987 by Ian Wyder who made this product in Canada. It was a big hit in Vancouver, BC and later made its way south into Washington and Oregon. Now it's offered here in the Bay Area. Wyder's claims to use apples grown in northern British Columbia, using McIntosh apples along with Spatans, Newtons and Delicious. 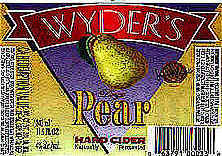 Joanie, a famous Burlingame cider fan, prefers the Wyder's Pear Cider. We also have their raspberry-flavored tipple. This is an Irish cider...we have it in stock presently. Amazing to me is how much of this we pack to ship to folks well out of the area. Frankfurt is more an industrial city, but it actually has a remarkable tradition of apple "wine." There's a part of town called Sachsenhausen and this area has lots of apple wine (ebbewoi in the local parlance) places. 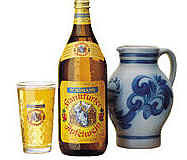 The largest producer is Possmann and they've been making their apple wine for more than a hundred years. This is not a universally-appealing beverage. Some say it's an acquired taste. We were in Frankfurt one sunny, summer afternoon and took one of those ferry boat cruisers up and down the river...they offer snacks and beverages, so we ordered a glass of Possmann's. This was great...one of our friends took a sip, expecting a nicely fruity, slightly sweet, apple-juice-like beverage and she started jumping in her chair as though being prodded with electricity. This was so dry and so acidic, that she was totally shocked! But there are many fans of Possmann's and we carry it in the shop. We are delighted to have found a really good bottling of Basque Cider from Spain. We had, once upon a time, a lovely, tangy crisp sidra, but the importer freaked out seeing the bottles were all hazy, cloudy and with sediment. They discontinued carrying cider after that, unaware that good sidra usually is not crystal clear and sediment is "okay." We have a delicious, fairly dry, crisp (some may call this 'sour') cider called Bereziartua. This is bottled just a few minutes' drive south of San Sebastian (Donostia, if you prefer). The apples (several varieties if we understand correctly) are harvested and crushed and processed. The juice then is transferred to wooden tanks, called kupelas, for fermentation and maturation. If you're thinking this stuff is a nice, fruity, sweet beverage, better think again. It's an adult beverage and, for some folks, an acquired taste. Lovely for those with a palate for this stuff, but it's not for everybody. 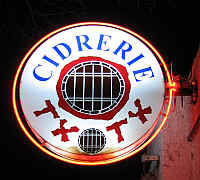 A cider place in Basque county is called "Txotx" (sounds like "choch"), the sound and name of a stream of cider that's being tapped out of a wooden cask full of cider. We used to have an Oregon cider which was pretty good, but the fellow making it ran out of steam (and money) and sold his business to a young couple. Today it's called the Wandering Aengus Ciderworks and it's owned and operated by Mimi Casteel (her folks own the Bethel Heights vineyard and winery) and Nick Gunn. The name comes from a poem written by William Butler Yeats which makes reference to a "girl with apple blossom in her hair." They've planted various English and French apples around their facility near Salem, Oregon. They farm organically and buy apples from growers who share an interest in sustainable agriculture. We were impressed in tasting their line-up and selected two ciders for the shop. The Wanderlust is "Medium Sweet" and it's a blend of French, English and North American apples. This has a noticeable level of sweetness without being cloying or sticky. In fact, we're impressed by the balancing acidity. Very fine! The "Bloom" is a "Dry" Cider and you'll find it crisp and rather dry on the palate. You can drink it on its own, of course, but pairing it with some sort of pork or poultry dish makes sense, too. The 750ml bottles are sale priced at $6.99 and many people in the neighborhood are fans of this. HOW ABOUT VISITING OUR WEB PAGE ON CALVADOS?